Anyone who has been to my house or has seen pictures on my Instagram stories can attest to the fact that I ALWAYS have bananas turning on my counter! I buy the bananas, the children say they’ll eat the bananas but then two days later the said bananas are still there, slightly mushier. What can you do?? Well, one thing is to make banana muffins! This time of year I’m always trying to make extra snacks for lunches or breakfast that kids will like and pack a little punch. My youngest, Isaac has been asking all week for muffins so I decided to wait for him and make them together after school. What you can’t see in these ridiculously adorable photos, is the fact that I totally cringe when my kids make something with me. I know it’s all a learning experience (which I aim to give them) but it also drives me nuts that the scoop was backwards, there were drips, at one point while mixing the wet ingredients he began spinning the bowl so the contents all went up to the sides and guess where that coconut oil went?!? Yup, all over the place! 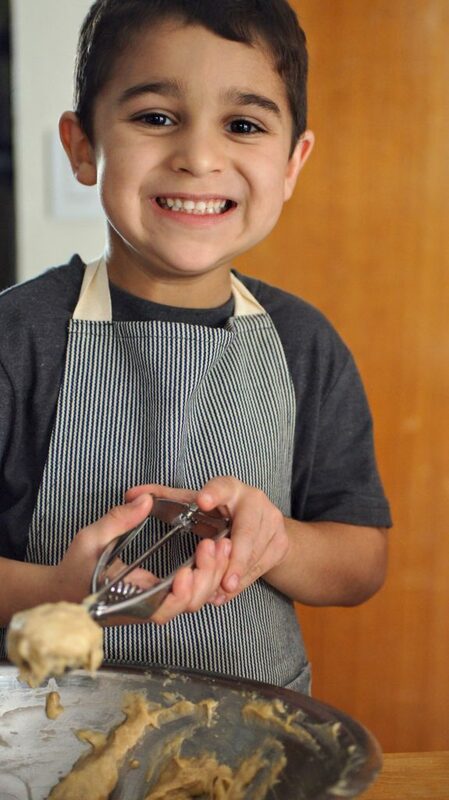 But despite the craziness, what I do stress and teach my kids is about good wholesome food, cleanliness in the kitchen and proper etiquette while cooking or baking. If my kid touches their nose, they go wash their hands AGAIN! If they lick their finger, guess what, hand washing AGAIN! 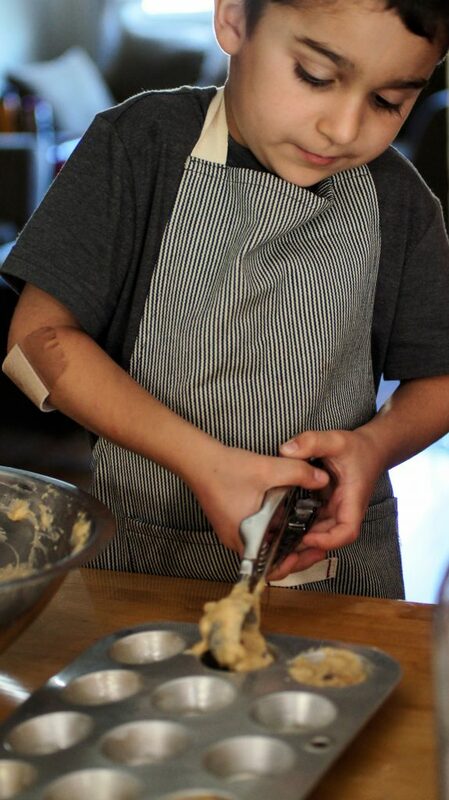 I want them to learn to be confident in the kitchen but that also goes with knowing the proper way to work. In the end, we both had a fabulous time making these sweet little treats. The suggested prep time listed below is WITHOUT a 5 year old helping (obviously)! I would double the time if a little one is doing the work! I hope you enjoy some of these hilarious and inspirational pictures and inspire you to bake with your littles. As always, I would love to see your creations! Tag me on Instagram @CosettesKitchen or post on my Facebook Page. 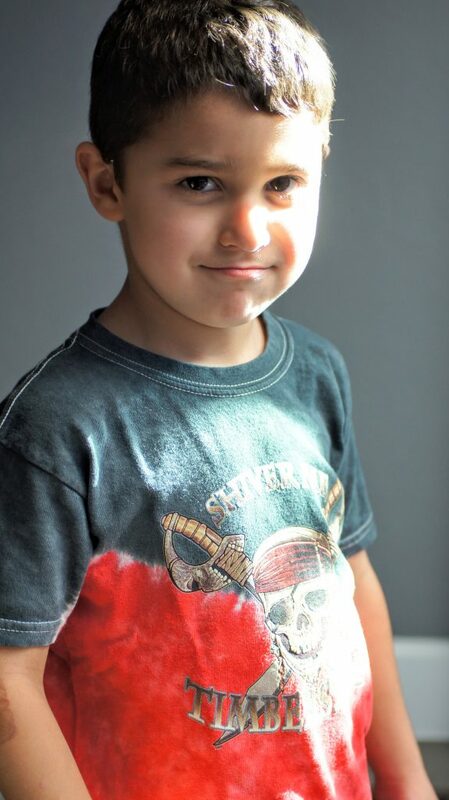 I’m sure Isaac would LOVE your feedback as well, leave him a comment! Can I eat the muffins yet MOM?? Combine all the ingredients for the topping, combine and with a fork cut butter until mixture is crumbly. Preheat oven to 400 degrees F Grease 36 mini muffin tins with non-stick spray. Combine all the dry ingredients in a large mixing bowl. Set aside. In another smaller bowl, mix mashed bananas, egg, vanilla and coconut oil. Mix together with a fork until combined. Pour the wet banana mixture into the dry ingredients and fold gently until just combined. 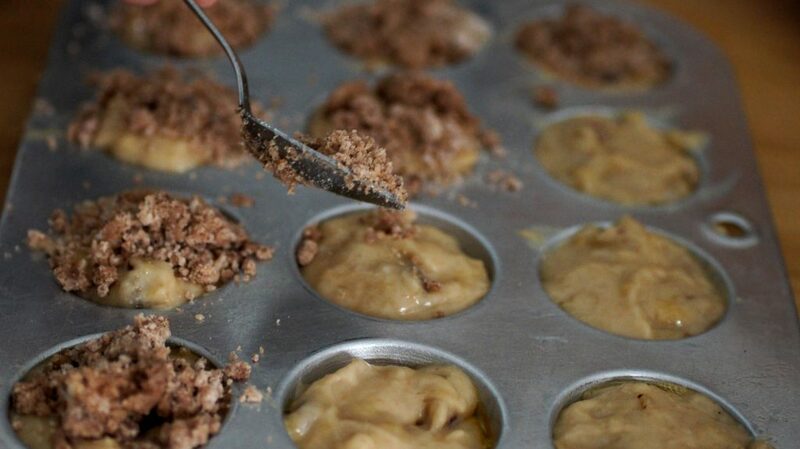 Fill mini-muffin tins to the top of each prepared muffin tin. 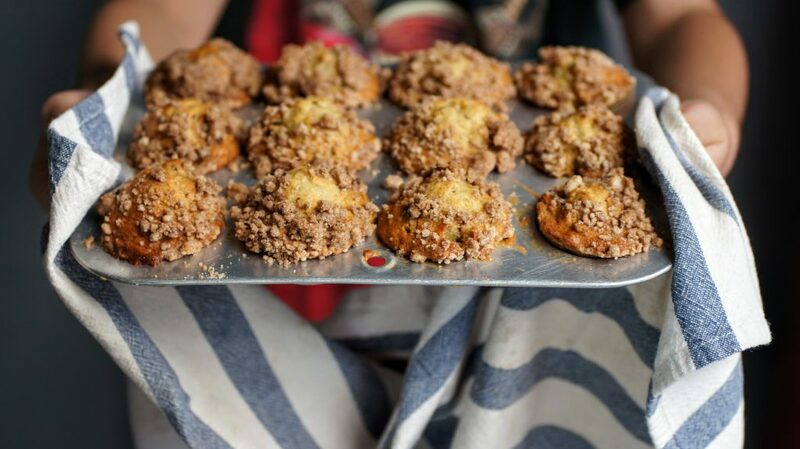 Top each muffin with some of the crumb topping mixture. 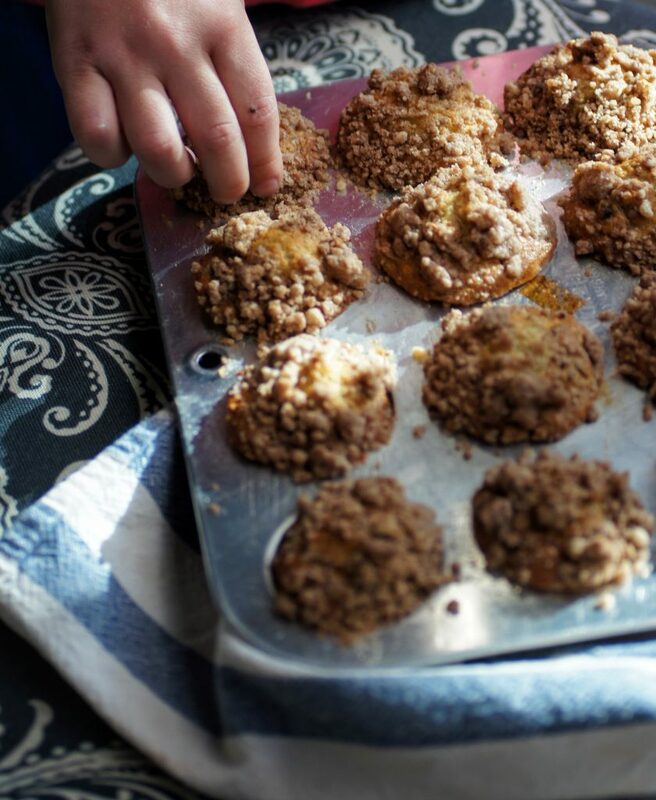 Bake for 5 minutes at 400 degrees, then immediately reduced temperature to 375 degrees and bake for another 15 minutes or until muffins are done with a cake tester. Remove from oven and let cool for 5-10 minutes then transfer to cooling rack. Enjoy! Walnuts are optional and can be subbed for mini chocolate chips or omit completely.